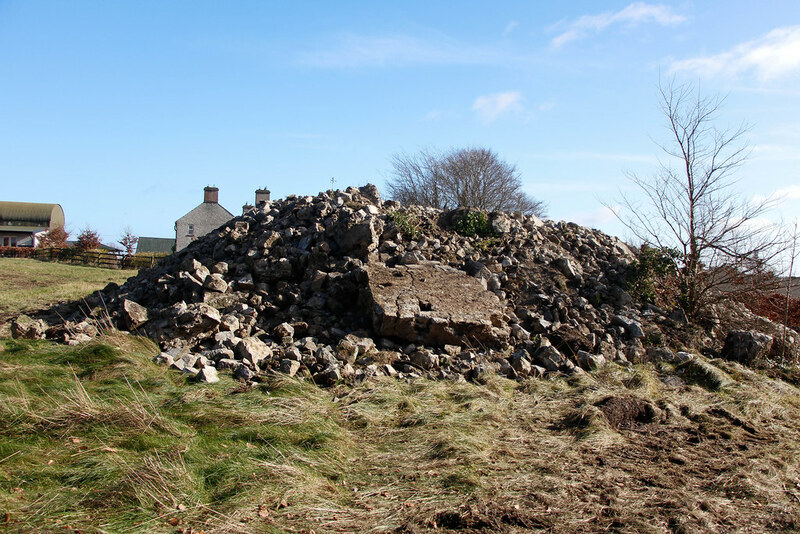 The Standing Stone: Coolbanagher, Hall/Tower House (demolished), Co. Laois. 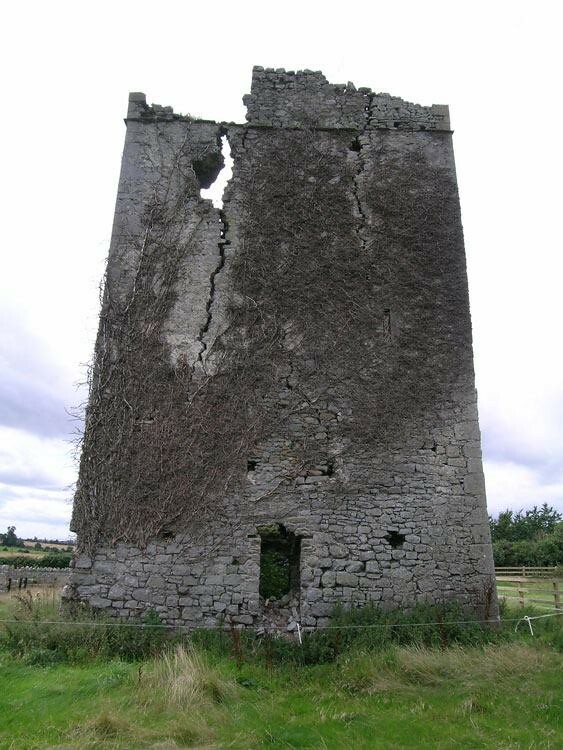 Coolbanagher, Hall/Tower House (demolished), Co. Laois. 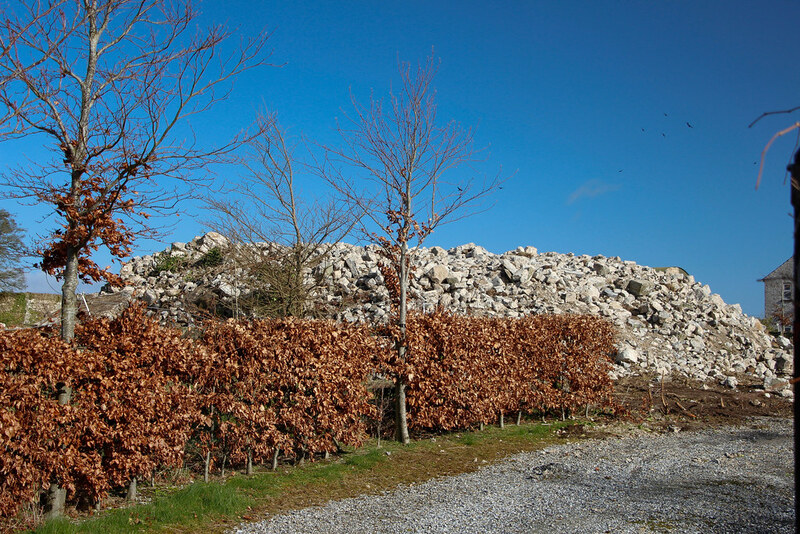 Location – Located between Portlaoise and Emo near Shaen hospital. 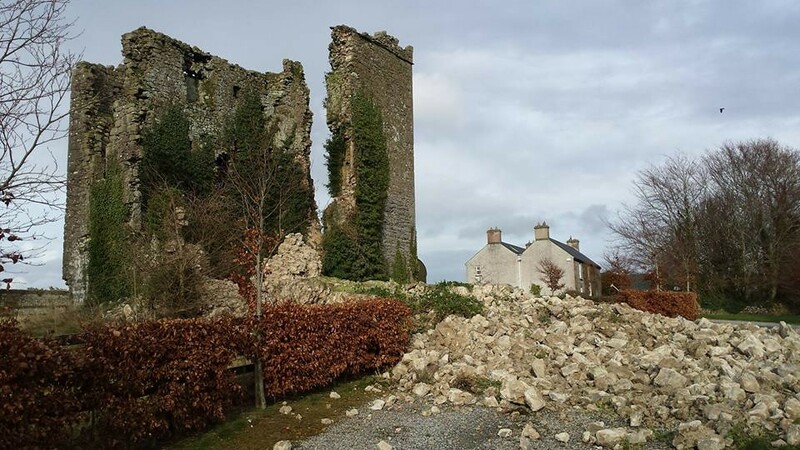 “The Department is aware of recent events at Coolbanagher Castle, Co Laois, a Recorded Monument (LA008-015---Tower House) under the terms of the National Monuments Acts 1930-2004. The castle is in private ownership and is not maintained by the Office of Public Works, as is the case with national monuments in the ownership or guardianship of the Minister for Arts, Heritage and the Gaeltacht. 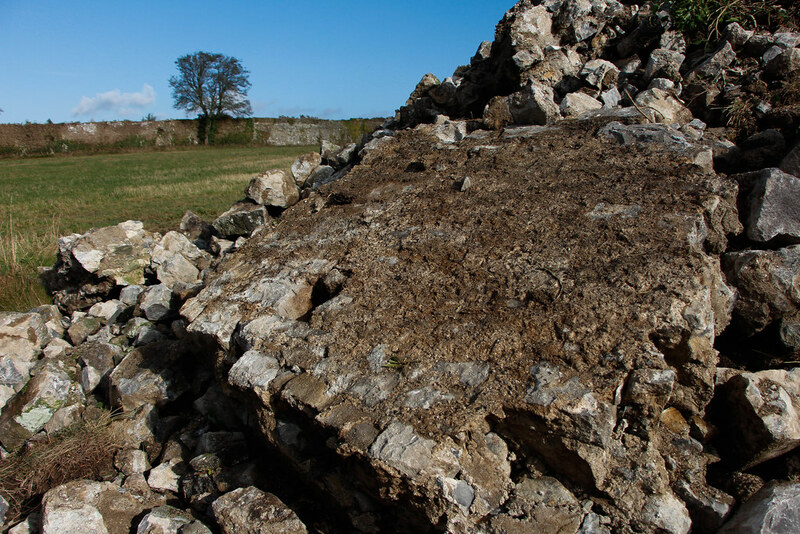 On 17th February 2014, the Department was informed of the collapse of extensive sections of the structure of the Castle due to storm damage. 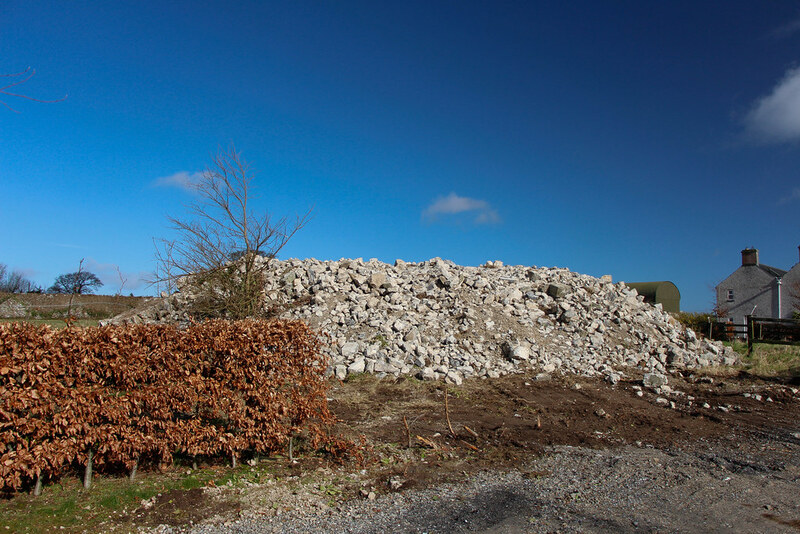 In response to urgent health and safety concerns raised by the property owners, the Department advised that immediate engineering advice be sought and that Laois County Council be contacted as the responsible authority for dangerous buildings. On Friday last, 21 February, the property owners informed the Department of their continuing concerns and of their intention to make the remaining structure safe. 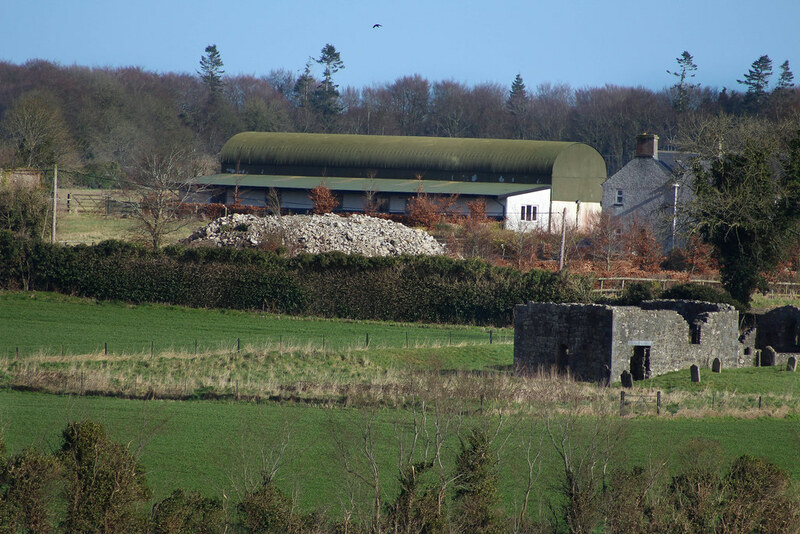 Having regard to the pressing concerns raised by the owners, the Department, on grounds of urgent necessity, granted consent for the removal of such parts of the structure as was identified as being strictly necessary to comply with specific directions from Laois County Council under dangerous buildings legislation or by a qualified engineer as being immediately and urgently necessary on the grounds of protecting public safety. An investigation of the site was carried out in 1969 which determined that the castle was originally a hall house that was most likely built in the 13th century. This is quite significant as it places the construction of the castle in the early period of Anglo-Norman stone built castles in Ireland. Its proximity the Rock of Dunamase also needs to be taken into account. Both castles were likely to have been active at the same time. Close by is the site of Shaen castle (destroyed in the 19th century to make way for the present hospital) and Morett castle which still stands. Together they form a series of satellite castles to the more significant fortress of the Rock of Dunamase. This makes Coolbanagher a significant in the local historical context. A lease from 1551 survives which gives the castle and surrounding lands, for a period of 21 years to Ralph Bagenal. The castle is described as being in state of decay which further testifies to its antiquity. 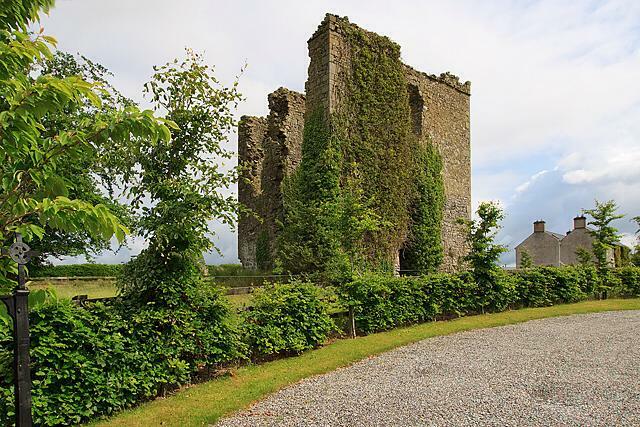 In 1563, before the previous lease had expired, the castle passed into the hands of Robert Hartpole and later his son William Hartpole who were the Constables of Carlow castle. Under Robert and William the castle was repaired and altered to be more in keeping with contemporary tower houses. Fireplaces were added, windows enlarged and the floor levels altered. There is evidence to suggest that some changes were also made during the 18th century. In 1903 the castle was once again described as being a ruin covered in ivy which it remained until February 2014. Before storm Darwin the castle stood to three storeys high and was roughly 11m x 7.5m wide. It was made of coarse rubble limestone and had a slight base batter. No floors remained as they were all wooden. The North, South and East walls were nearly preserved to full height with the West wall having fallen down at an unknown time. The original doorway was located in the North wall and there was a possible spiral stairwell located in the South-West corner of the tower. As mentioned above, following assessment after storm Darwin, the castle was demolished. The ivy growth on the South wall undoubtedly contributed to its collapse as ivy growth seriously undermines the stability of structures. No effort was made to stabilise the remaining portions of the castle and a significant piece of national heritage is no more. However, as stated above there were serious and immediate safety concerns surrounding the site and there was possibly not the time to begin such works. It is important not to assign blame in such situations and much criticism has been aimed at the landowners and local authorities over the castle's collapse. As there is considerable confusion about what happened, such blame is unhelpful. 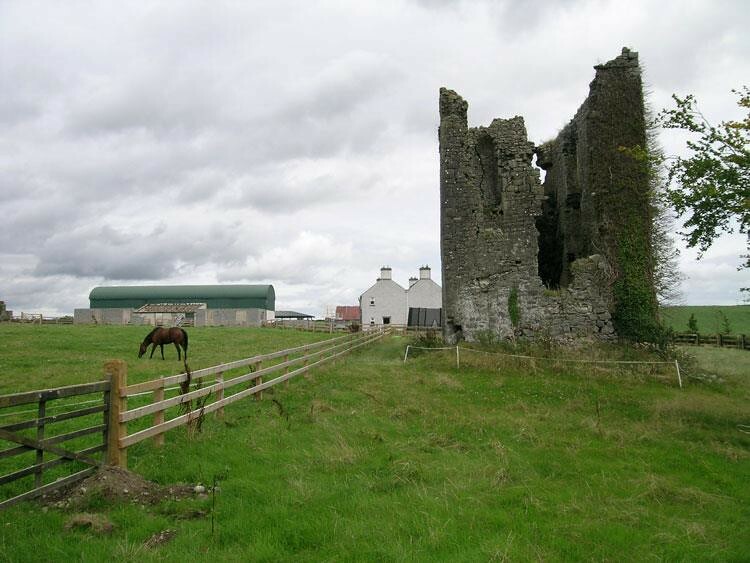 There are 30 castles with remains in Co. Laois and a further 42 of which no remains are visible. 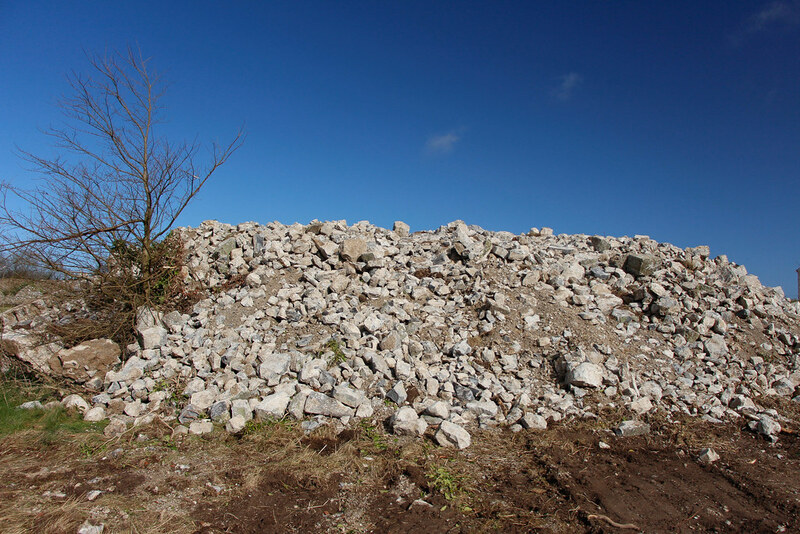 Once the rubble is cleared away from Coolbanagher that will make 43. I wonder which castle could be next. 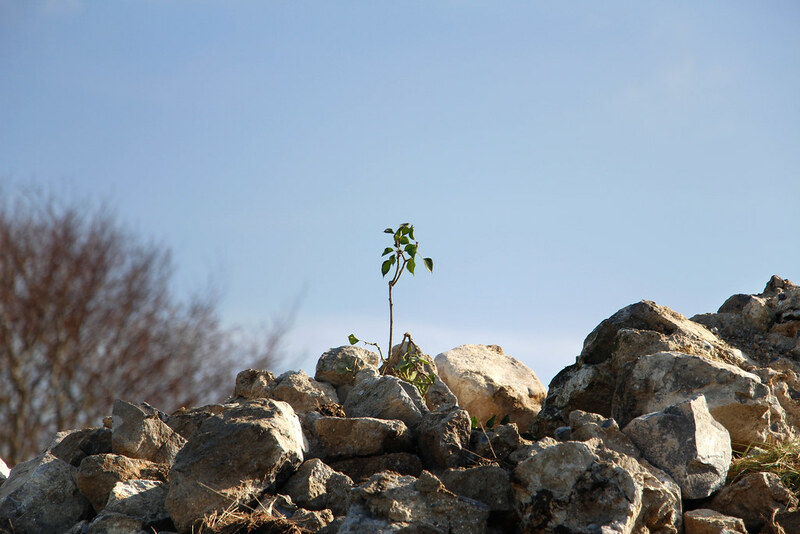 Difficulty – East to spot as it’s a pile of rubble. There is some space to park on the grass verges on the road leading to the site which is on private property so please do seek permission. Unfortunately, I did not visit site before its destruction. This image is owned and copyrighted to Mike Searle. This image belongs to the National Monuments Service. This image is owned by the National Monuments Service. The castle following Storm Darwin on 12th February, 2014. 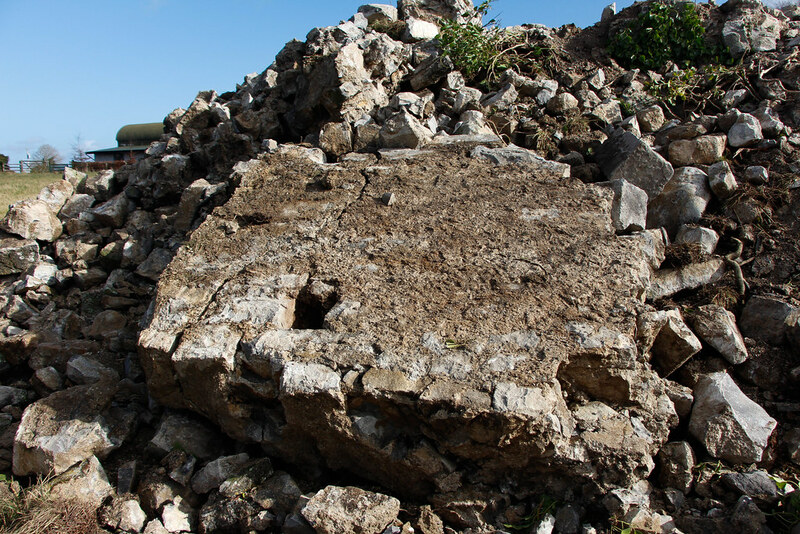 Image supplied by Laois Archaeology. Taken from the entrance to Shaen hospital. In the foreground is Coolbanagher church. The pile of stones in the middle of the picture is what remains of the castle. This picture and all subsequent pictures were taken by Maria J. Guillen who, as of February 2014, takes the majority, if not all, pictures for The Standing Stone. This portion of wall is the largest portion still held together that was visible. 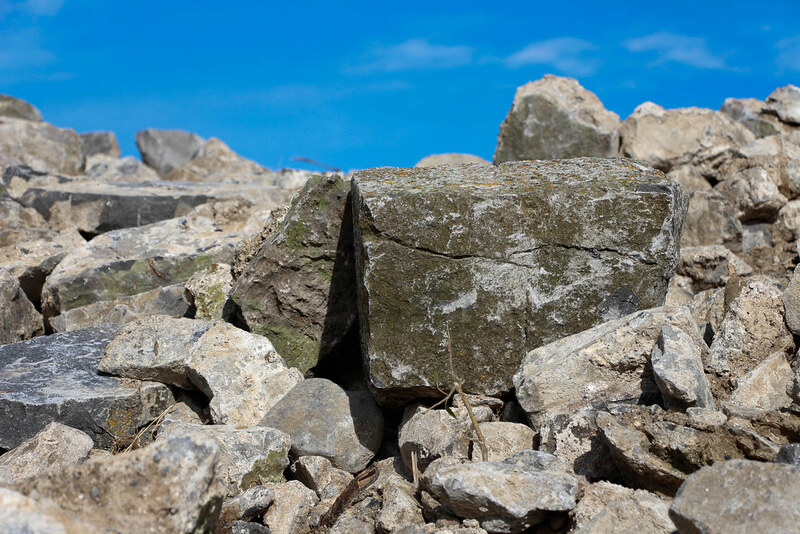 Occasionally among the rubble a piece of worked stone is visible. 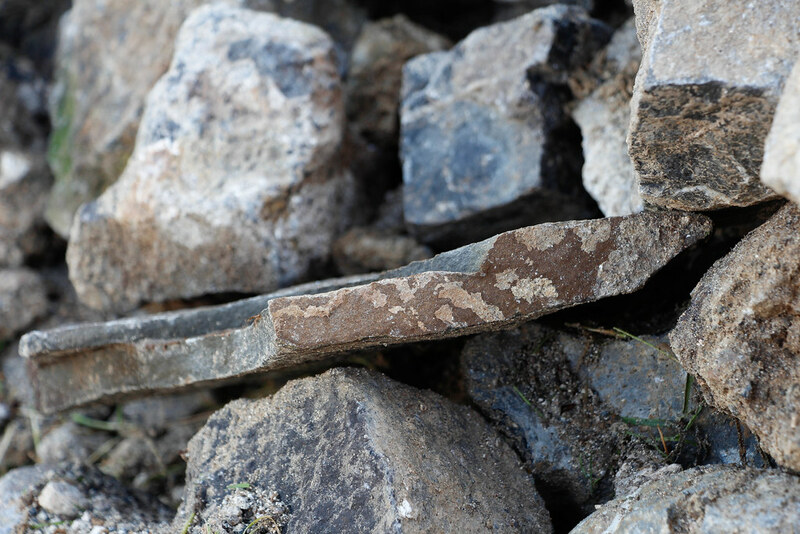 A quoin stone among the rubble. A piece of ivy emerges above the former castle. I hope the land owner doesn't think he will get away with this as he will not! Big fine coming your way. This is not a shame, it is shameful! And a serious failing of the Department of Arts, Heritage and the Gaeltacht. A national monument raised to the ground in the space of two weeks without a proper statics or conservation study! Did the engineers not consider fencing off the area, buttressing or the bracing of unstable parts of the structure? Clearly valuable lessons can be learned from the care of monument in Greece or the heritage management in any earthquake affected country. Unfortunately it is too late for this monument. Thank you for your input Christina. The owner claims they tried to save it and it fell over. However, that pile of rubble is from a machine putting it there. We're still find out bits and pieces about this. Sadly, this wasn't a national monument and not subject to the same preservation orders that apply to them. Just another in a long list of historic Irish buildings that we have failed to protect. 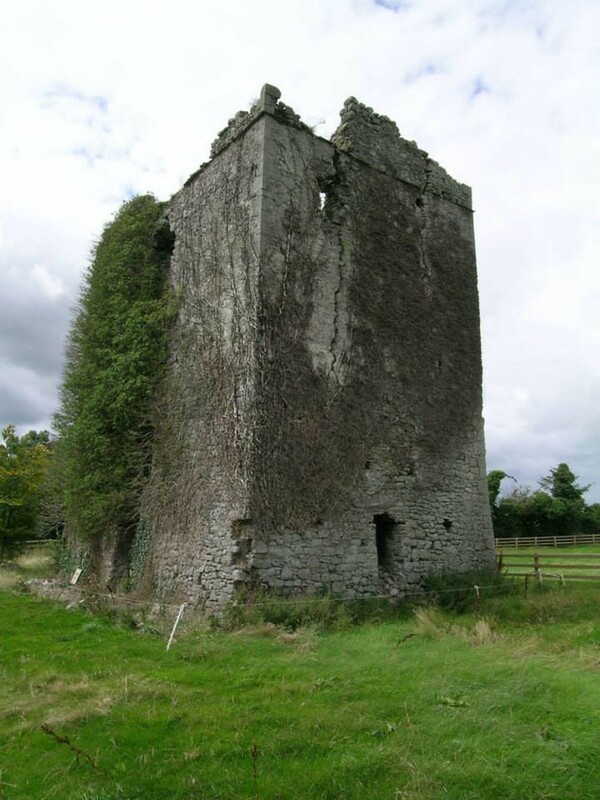 For anyone interested in trying to save nearby Lea Castle from a similar fate there is a meeting in Portarlington Community Centre next Tuesday 11th March at 8.00pm to discuss a conservation plan for the castle. All welcome to attend, come along and show your support for the conservation of our built heritage. I intend to be there David.